Fluorometrics Instruments offers the new DOPO2 series probes, where the electro-optical module is combined with the sensor in one 5/8” (15.9 mm) OD Stainless Steel probe. These robust probes can be used for many different applications, in both gaseous and aqueous environments. 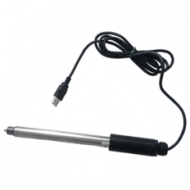 With a pressure and temperature sensor embedded into these probes, they can be used to monitor Oxygen partial pressure and temperature in various mediums. DOPO2 system can be used with a replaceable stainless-steel cap that is screwed to the probe housing or it can be attached to the various fiber optic oxygen probes with embedded temperature sensor. The DOPO2 connects to a PC via USB connection and saves your data in an easy-to-use Microsoft Excel format. DOPO2 can be configured with single-channel LED excitation and detection, and modulation frequencies up to 31.2 kHz. The on-board pressure transducer and thermistor measure atmospheric pressure and temperature. Cap is not included in the priceDimensions:OD: 16 mmL: 260 mmWeight:179 gPrinciple:Photoluminescence..
DOPO2-PRO system is the desktop version of DOPO2 which has a communication board attached to the pro..